In all of India, particularly in South India where we live, temples, shrines and ashrams are common. Every town, even the smallest village, has at least one. Some are ancient, with roots over 2000 years. Some are more recent, being built within the last 100 years. The earliest temples are cut from rock, and date back to a few hundred years BCE. Ancient temples date to early CE, as exemplified by those found at Mamallapuram. 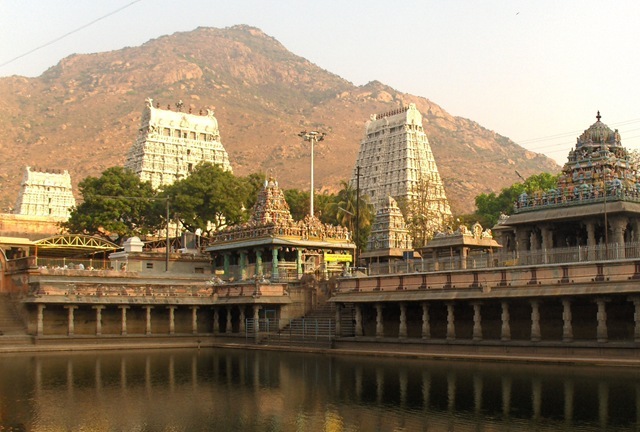 Some, like Arunachaleswara Temple in Tiruvannamalai, were celebrated by Tamil poets in the first century CE. Long before these, there were shrines with simple rock lingams and a Siva trident (Trishul). These ‘primitive’ shrines are still seen today. We have visited only a few temples and shrines so far, and have made blog entries for only some of them, ones that we felt were significant for one reason or another, especially if there was an association with Bhagavan Sri Ramana Maharshi. This posting gives an easy way to navigate to these postings and for you to join us on our visits to these sacred spots. More on temples can be found here, here, and here. I will update this post from time to time. This entry was posted on March 11, 2010 at 12:35 pm and is filed under Arunachala, Spirituality, Tamil Nadu, Temples, Shrines and Ashrams, Tiruvannamalai. You can follow any responses to this entry through the RSS 2.0 feed. You can leave a response, or trackback from your own site.